Just perfect. Chill, nice people. Fantastic hostel! Great, welcoming people, amazing breakfast, free caipirinhas every afternoon, comfortable beds and a pool! Excellent location. I can’t find any fault- highly recommended! That's right, my first 10! Owner is a nice brit who seems to love Salvador. He has definitely travelled the world because he knows what Backpackers want... Breaky till 12..and its one that you can't miss! Juices, fruits, eggs & sausages. Your prepared for the day. Free caparinha hour is a big plus - Hang out in the pool and get the night started! Rooms have AC and private bathrooms. Pizza available till late in the night..Don't know what negatives to say...Cheers! This place is number 1 in town. Great social place. Paulo the owner is a top man too... minus the fact that he’s a LFC fan! I would definitely recommend this place if anyone’s visiting Salvador. The best hostel breakfast I’ve ever had. The down fall is sometimes you can end up staying around the corner in accomodation and not actually in the hostel. 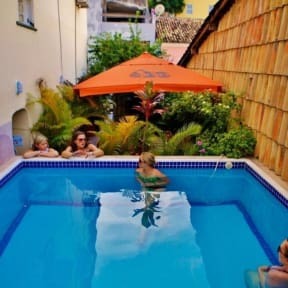 Which means you need to walk over to swim in the pool, to drink in he caipirinha happy hour and also to have breakfast. I didn’t stay over there but I imagine it would be pretty annoying. 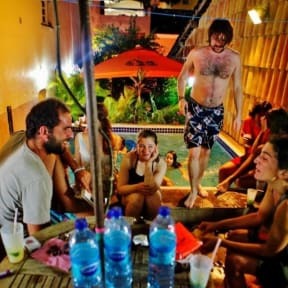 One of my favorite hostels in Brazil! The breakfast is hands down the best I have had in a hostel with fresh fruits, eggs, cakes and juices. I would book this hostel again just because the breakfast to be honest, but the staff is also welcoming and friendly and the facilities are great too. The hostel is good for a solo traveler, the atmosphere there is open and social and the daily free happy hour is great for meeting people. Amazing place. Especially if you are a solo traveler looking to meet people: capirigha hour is perfect for socialising, meeting friends for your next excursions or just getting tips and ideas. The breakfast is fab and last till late if you wanna have a big night and not miss breakfast the next day :) I am super glad I choose Galeria 13 as I met lots of people, some of those I was happyly surprised to find in my next hostel. Galleria's capirigha hour has made my trip amazing! Really friendly staff including the owner who somehow memorised the name of everyone staying at the hostel - great personal touch. The pool is small but nice and the free breakfast is by far the best I've had at any hostel (and goes on until 12!). Free caipirinha hour is an excellent added bonus.